The BND (German: Bundesnachrichtendienst) is the foreign intelligence agency of Germany, directly subordinated to the Chancellor’s Office. Its headquarters are in Pullach near Munich, and Berlin (planned to be centralised in Berlin by 2016, with about 4,000 people). The BND acts as an early warning system to alert the German government to threats to German interests from abroad. It depends heavily on wiretapping and electronic surveillance of international communications. It collects and evaluates information on a variety of areas such as international non-state terrorism, weapons of mass destruction proliferation and illegal transfer of technology, organized crime, weapons and drug trafficking, money laundering, illegal migration and information warfare. Following Snowden’s leaks (Der Spiegel) and the recent revelations from WIKILEAKS , many bloggers/journalists have tried to “guesstimate” the organizational structure of the BND. It turns out that the “leaked structure” (Rated SECRET or CONFIDENTIAL) is basically the one you can read on the BND official website. Go figure! The BND’s divisions, branches and units are designated by codes that consist of letters, written in capitals. In the current situation the main divisions have a two-letter designator which is more or less an abbreviation of their full name. The SIGINT division is for example TA, which stands for Technische Aufklärung. From the e-mails published by Wikileaks we learn that lower units are designated by adding additional letters or words to the division designator. It seems that these additional letters can be the first letter of a full name, a more or less random letter, or A for the first unit, B for the second unit, etc. On December 11, 2016, German press reported that according to a high-level security officer, there’s a high plausibility that the commission documents published by Wikileaks were stolen during a large hacking attack on the German parliament’s internal network late 2014/early 2015. This attack was discovered in May 2015 and showed patterns similar to APT28 a.k.a. Operation Pawn Storm or the Sofacy Group, a hacker collective which is probably sponsored by the Russian government. The timeframe of this hacking attack could explain why Wikileaks has no commission documents dated after January 2015. 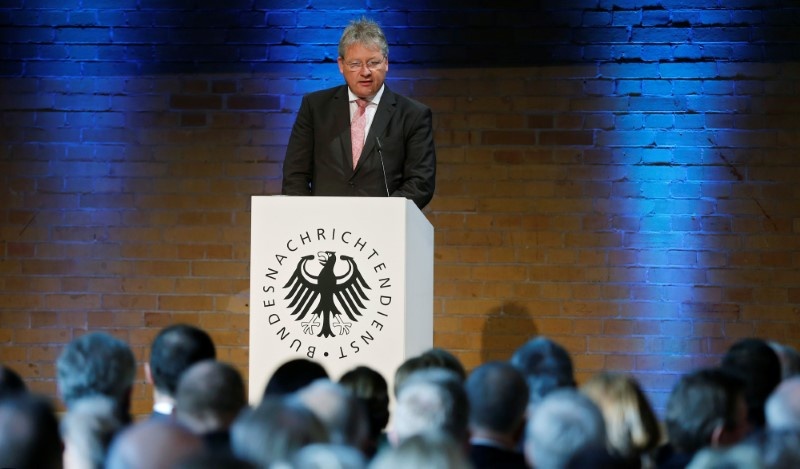 The President of the BND is Bruno Kahl. RELATED POST: German Intel Agencies first accuse Russia, then investigate and now report: ‘No evidence of Russian disinformation campaign’. The President of the BND has three deputies: one Vice President, one Vice President for Military Affairs (Since December 2003), and one Vice President for Central Functions and Modernization (Since 2013?). Since 2009, the BND is divided — as far as we know — into the following 12 Directorates — which could be grouped in 4 categories. These Directorates are clearly responsible for HUMINT, Organized Criminality and Terrorism, as well as Proliferation. This is where analysts prepare intelligence reports. LB is responsible for Africa, the Middle East and Afghanistan, while LA has the rest of the world. These 4 directorates (LA, LB, TE, TW) correspond exactly to the structure described on the BND website. These Directorates are clearly responsible for SIGINT as well as IMINT and OSINT. These Directorates include the Command and Situation Centre, the information hub of the BND. Global developments are followed closely on a 24/7 basis. 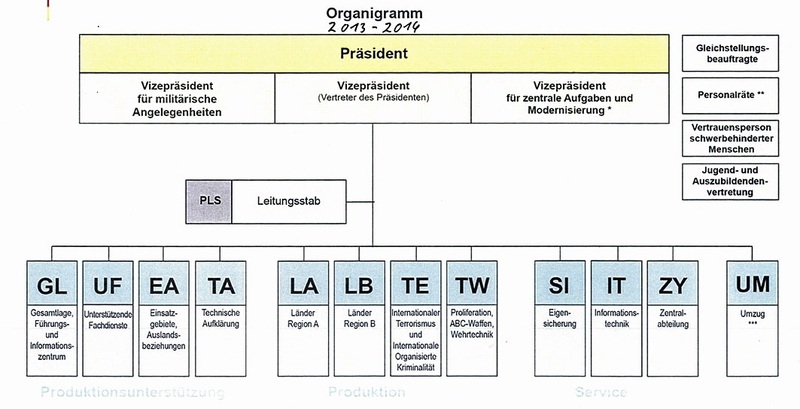 According to the BND website, the current structure is reduced to 3 Directorates: GU, OL and TA. GU seems to be a fusion of GL and UF. OL seems to be the old EA renamed “Operative Unterstützung und Liasion”. These Directorates are in charge of Security, Administration, IT and R&D. Today, these Directorates are named: SI, IT, ZT and ID.They refer to Security, Information Technology, Data Protection and Inner Service. Finally, there is also a directorate called: Gesamtumzug (UM) (Relocation to Berlin). The Relocation Directorate is responsible for all tasks and projects relating to the new headquarters in Berlin.